Salvador Dalí is one of the most famous artists of the 20th century, but there are far more aspects to the artist’s career than just his notoriously mind-bending paintings. 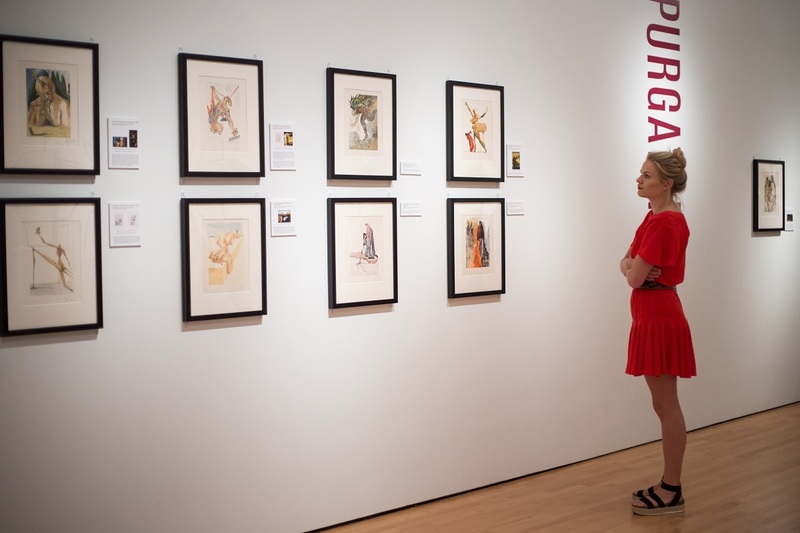 This summer, an exciting new museum exhibition begins touring the United States aimed at calling attention to Dalí’s revolutionary work in the field of book illustration. 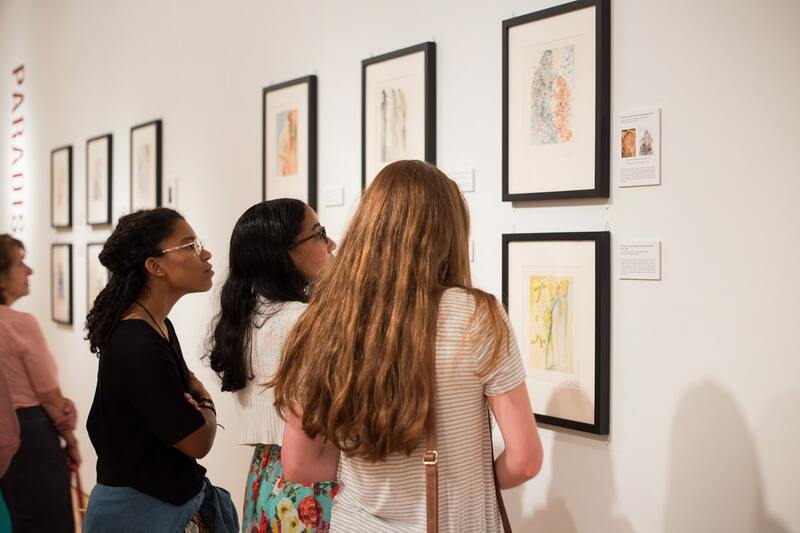 “Dalí’s Stairway to Heaven” presents the portfolios of these two monumental illustration projects side-by-side, allowing visitors to trace Dalí’s evolution as an artist. Each project comes from a different era in Dalí’s life. He completed his 43 illustrations for “Les Chants de Maldoror” in the 1930s when Dalí was proudly identifying himself as a Surrealist. At the time, the subject matter was ideal for Dalí. The poetic non-linear novel was all about a man who had denounced God, humanity, and conventional morality. 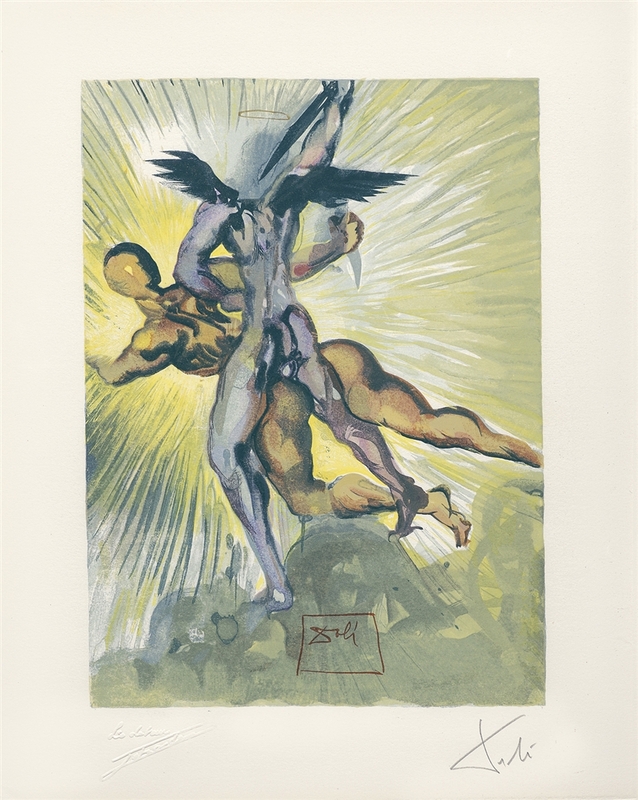 “Divine Comedy—Purgatory 8: Les anges gardiens de la vallee” (Guardian Angels of the Valley, 1959-1963), Salvador Dalí. From the “Stairway to Heaven” exhibition. Dalí first became involved in the project after Pablo Picasso told Swiss publisher Albert Skira that Dalí would be the perfect artist to illustrate a new edition of Lautréamont’s book. 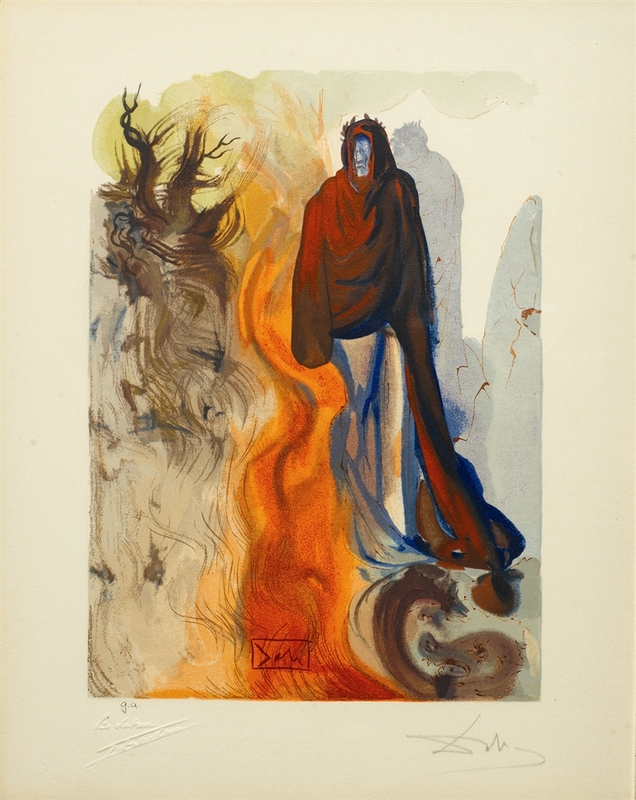 When Dalí illustrated Dante Alighieri’s “The Divine Comedy” two decades later, he was a much different man. By the 1950s, he had renounced Surrealism and embraced Catholicism. Thus, Dante’s famous story of a man traversing the levels of Christianity’s Hell, Purgatory, and Paradise held special meaning for Dalí. “Divine Comedy—Inferno 34: Apparition de Dite” (The Ghost Spoken Of, 1951-1964), Salvador Dalí. From the “Stairway to Heaven” exhibition. 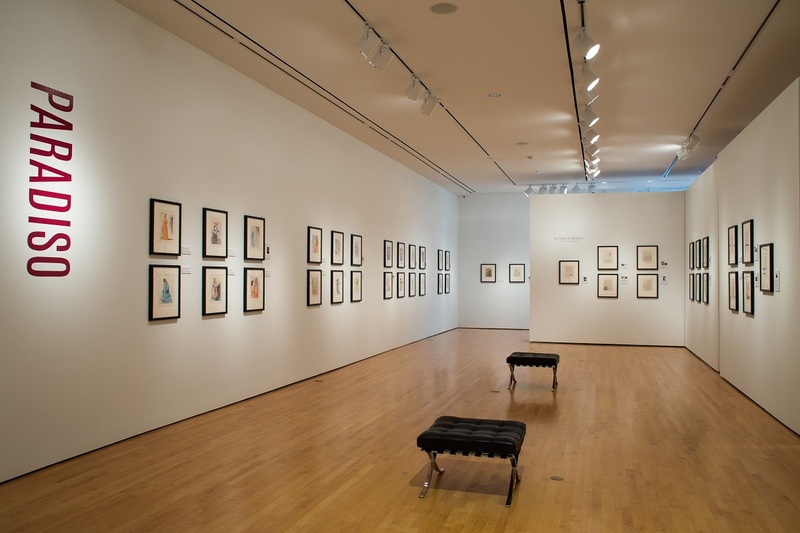 “Dalí explores subjects that were significant to him personally and, in both works, he self-identifies with the central characters, Maldoror and Dante,” says David S. Rubin, curator of the exhibition. 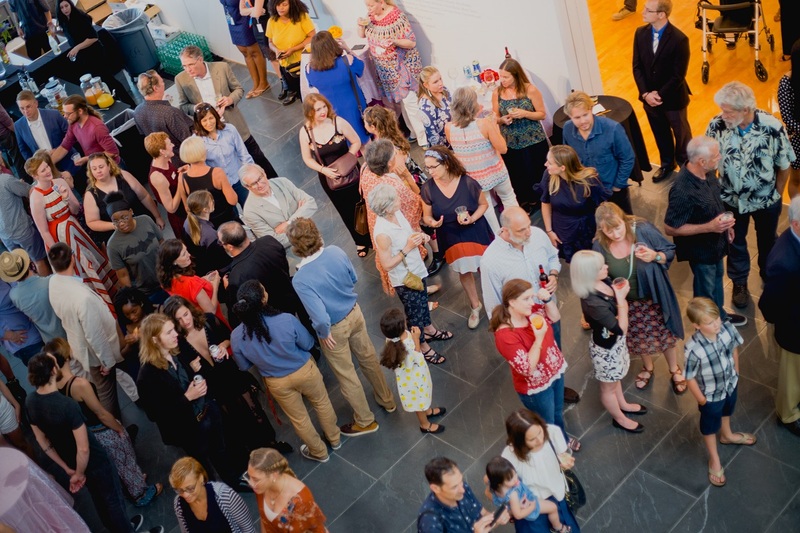 Crowd circulates at the opening night for “Salvador Dalí’s Stairway to Heaven” at Louisiana’s Hilliard University Art Museum. 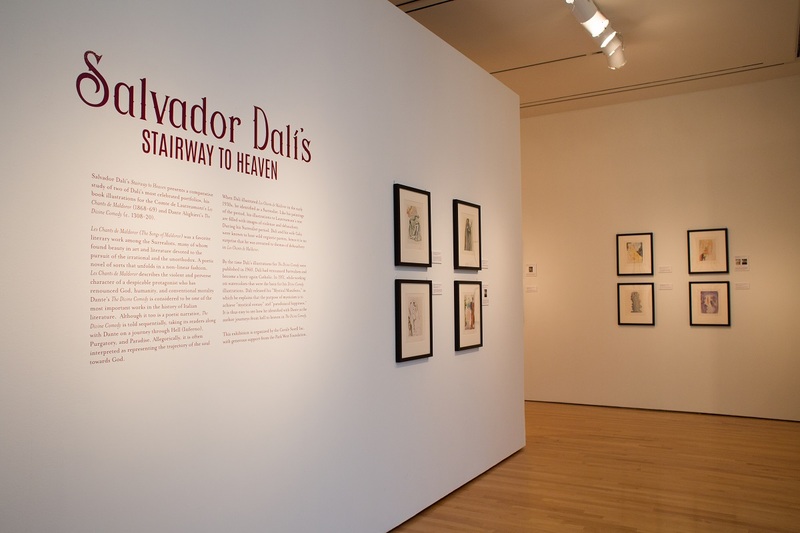 One of the galleries featuring “Salvador Dalí’s Stairway to Heaven” at Louisiana’s Hilliard University Art Museum. For those interested in learning even more about this period of Dalí’s career, the book “Dalí—Illustrator,” written by Eduard Fornés with a foreword by Daniel David—two noted Dalí experts—presents a comprehensive history of the artist’s illustrative works. 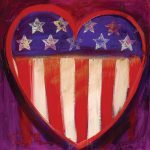 For more information on the Park West Foundation and its museum exhibitions, click here. Any chance the exhibit will come west? Would love to see it in Seattle or Tacoma area! will this new exhibit be coming to Florida? Hello Gerald! There are currently no plans for a Florida exhibition, but be sure to check back for any updates! Dali has always been my favorite artist. So excited to learn about this tour. I should get an opportunity to see this in either Lafayette or San Antonio (or both). Thanks for sharing this story. I agree. It would be nice to see it here in the Pacific Northwest! On the west coast there is a permanent museum in Monterey, and a permanent exhibit at SFMOMA. Please come Southwest! 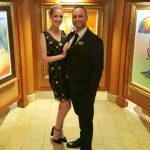 Las Vegas! Or at least L.A.
Yay! Coming to Atlanta area.